Почему левая? В тэгах указано имя авторов - вокалистки-клавишницы и гитариста. Куда-то я его скачал... Сейчас не вижу куда. Явно не на этот винт, а по ссылке уже пусто. Хотя вроде понял, что мини-альбом так и не издали официально. 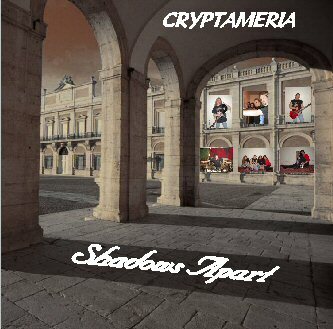 Cryptameria is a melodic metal band from Southwest Virginia. The band was formed in 1996 by Tim Parks (drums) and Patrick Redd (guitars). Tim came up with the name Cryptameria, taken from the Japanese evergreen "Cryptomeria japonica". Patrick and Tim began writing songs and lyrics but had no one to sing for them. In 1997, Dennis Warren came in and began to sing. From December of 1997 through March of 1998 the trio recorded a demo entitled "Root". In August of 1998, Cryptameria became a five-piece band with the addition of Harley Smith on guitar and H.C. Hodge on bass. As a two-guitar lineup, the band began to develop a unique style. In November of 1999, Cryptameria began recording their first full length CD entitled "Obelisk". It was finally complete in May of 2000. In July of 2000, Patrick decided to leave the band. As a four piece, the band started going in a new musical direction. In the next two years, Cryptameria played many local shows, distant local shows and two Metal Festivals (Milwaukee and New Jersey). In July of 2002, Dennis decided to leave the band. In August of 2002, Bobby Hicks (former singer for Mystic Force) came in as his replacement. Once again songwriting took on a new direction. In January of 2003, Cryptameria once again went through a lineup change as H.C. left the band. In March of 2003, Kevin Lewis (former guitarist for October 31) decided to play bass and come in and fill the open spot. Things were looking good for the band until, once again, another member decided to leave. Being with the band less than a year and not even playing a live show with them, Bobby left in July of 2003. After this, Cryptameria decided to remain a trio as Kevin took on the dual role of bassist and lead vocalist. This lineup was consistent for six months until the band decided that, since the music was going in a more progressive direction, a keyboardist would be a valuable addition to the lineup. In January 2004, Pamela Carpenter was asked to join the band full time on keyboards and began writing music and lyrics with Harley and Tim. The new creativity and musicianship of the members became even more unique and exciting. In August 2004, Kevin left the band for unknown reasons. Several potential bassists and vocalists were auditioned, but none seemed to be compatible with cryptameria's unique style. By november 2004 the remaining members decided to continue as a three piece, with pamela taking over the role of vocalist. Насколько понял, ищем демку с вокалистом? Фуф, наконец-то этот зловредный сайт отключили.